and the final report is.....no change. 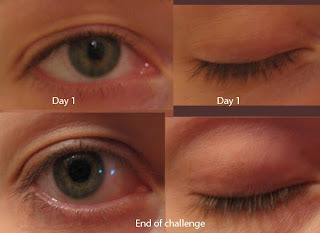 I like the mascara a lot, but don't bother with the lash boosting serum on its own. 73% of people use their email password for their bank password--don't do this! Unclutter talks about setting limits for a super simple month--I'm taking some of this advice. You Look Fab talks about tattoos--how do you feel about them? I have what I like to call an "executive tattoo"--it doesn't show when I'm dressed for work. Maybe I should have thought about it a little more before I got it...it does show when wearing most bridesmaid's dresses, for example. I don't regret it, and I doubt that I'll ever pay for removal. I think I'd just tell my 22-year-old self to go for what I really wanted, which was white ink. It would hardly show up. Speaking of removal...I had my second laser hair removal appointment yesterday. The results from my first appointment were fabulous--well over 50% hair loss and the hair that grew back was finer, thinner, and much easier to shave off. This is something I definitely don't regret paying for! Back row, left to right: snow boots (which I'll be wearing tomorrow! ), flats from Target, Chuck Taylors, black flats from Payless, knee high boots from Aerosoles. 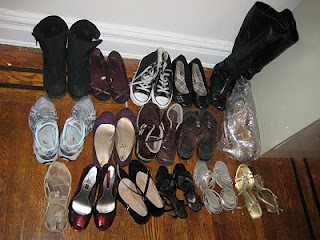 First row, left to right: These are all dance shoes. Hermes sandals, red peep toe Bandolinos (a steal from DSW), black character shoes, black strappy heels, silver strappy heels, gold strappy heels. Sixteen pairs of shoes, seven of which are solely used for dance jobs. And, um...this is not including any of my heels that live in a box under my desk. From what I can remember, there are three pairs of black heels (different heights), a pair of red loafer heels, and a pair of pinkish plaid heels. And a pair of slippers for when I get tired of the heels. Ahh, Chucks! Surprising no one else had a pair. I kinda thought I was the only person on earth who didn't own any. I think if you're going to get a tattoo, your 'executive' kind is the way to go. Personally I have no desire to get one. Not into body art (don't even have my ears pierced) and can't imagine what I would want to have permanently tattooed on my body. I admire those who do though. wow, hair removal! I've heard good things about it from everyone whose tried it! How much are you paying for your laser hair removal? Are you doing only parts or your whole body? I'm paying $900 (plus tips) for six sessions of IPL for bikini and underarms. You can read more about the specifics here. I'm glad you're seeing good results with your hair removal!